b) Jesus Christ – the son of god who was born into the world to save humanity – is replaced by a ‘visiting’ alien civilisation(s) which performs apparent technologically-based ‘miracles’. Whereas ‘chosen’ individuals in the religious past had god/Jesus reveal itself to them, in the modern world, alien visitors seem to pick individuals at random when they make themselves known, but the ‘revealing’ of advanced or hidden knowledge is an important element of theistic thinking, as it indicates a communication between humanity and its god/alien counter-part. The religious component of the Ancient Astronaut Theory is often hidden behind the fact that its adherents believe themselves to be ‘scientists’ rather than ‘religionists’. Generally speaking, they reject the outer forms of the Judeo-Christian tradition, choosing to interpret angels and other holy beings as often misunderstood and misconceived visiting alien beings, but they fully retain the inner, or ‘underlying’ aspects of the psychology of the Western, Judeo-Christian religious tradition. Ancient Astronaut Theorists appear to reject religious thinking, whilst actually perpetuating the very essence of the theological thinking they claim to have rejected. The use of modern technology is the idea that what exists today, existed in the past, despite the fact that there no evidence for any such existence within the historical record. The exploration and assessment of ancient structures and artefacts is undertaken so as to suggest that modern technology – or even a technology beyond that known today – was known thousands of years ago, even though such an assertion is completely out of place with what is known about historical and socio-economic development throughout the world. Whilst projecting the current level of technological development back into the ancient past, the Ancient Astronaut Theorists – due to a lack of material evidence – must rely on a type of secular ‘faith’ to maintain their beliefs. Again, this is the Judeo-Christian belief that evidence is not required for something to be ‘true’. It is this secular form of faith that holds all of the Ancient Astronaut Theory together. Therefore, even within the idea that modern technology existed in the ancient past, it is a religious faith that is required to legitimate it. Like the religious zealot who is continuously trying to gain converts for his or her religion, the Ancient Astronaut Theorist is continuously reacting to those who do not accept their interpretation of history, and they dichotomise the world into the ‘believers’ and ‘heretics’. This is no different to religious thinking modified to serve the purpose of perpetuating yet another myth – namely that of the early visitation to the earth by ancient astronauts. It is important that people ‘convert’ and ‘believe’ in the Ancient Astronaut Theory. If an individual does not believe, then he or she is psychologically rejected from the closed community of believers. Pseudo-science is used to continuously misinterpret material data, and this misinterpretation has served as a religiously motivated theory that has been profoundly affected by the development of modern technology. Modern technology is the product of logical and reasonable thinking – and not the product of theological thinking. Theological thinking has been proven detrimental for human well-being in the modern era, as medicine and technology routinely save lives and prolongs human existence. The dominance of theological thinking over the last one thousand years has been so powerful that it has only just begun to be abandoned in the Western mind. The ancient Astronaut Theory is a halfway house where a dying religious theology meets the robust and impressive technological development of the modern era. This assessment exposes the religiously based Ancient Astronaut Theory – but is not designed to ‘negate’ the idea that in principle it is likely that other beings exist in the universe, and that it is within the realms of possibility that these ‘aliens’ have either visited the earth in the past, or will visit in the future. These aliens may probably have developed a different and unique technology – but this must be factually discovered and ascertained not through the power of Judeo-Christian religious myth – but through the power of the human rational mind. Groupings of human beings – and presumably other types of intelligent beings – develop their culture, politics, and technology entirely as the result of their particular socio-economic conditions. The idea that an ancient alien either created or developed humanity is a demonstration of the inverted mind at work – or human perception operating back to front. This is no different to the false belief that a mystical god created a species of living beings out of nothing. Should alien civilizations exist, this should be observed as a material fact through a mind that functions the right way around – and that has abandoned inverted thinking. Inverted thinking sees connections between things where no real connection exists. 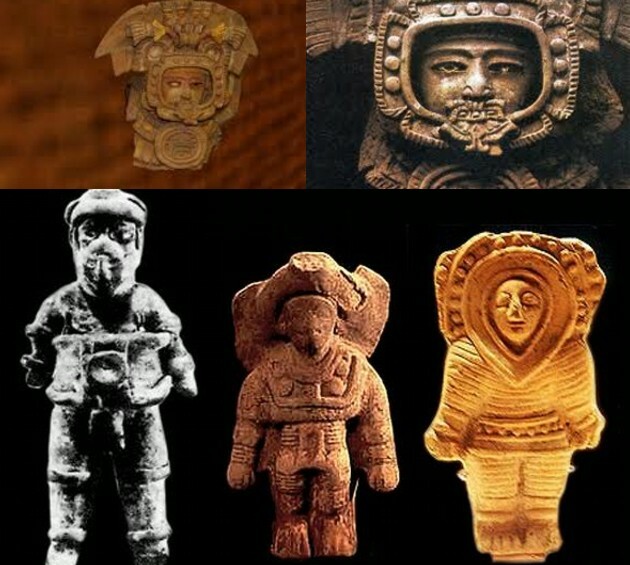 An ancient cave drawing, or stone engraving must portray a man dressed as a modern astronaut, but why should an ancient astronaut dress like a modern ‘earth’ astronaut? Why should an ancient alien astronaut thousands of years ago, dress in a manner familiar to contemporary humanity? The answer is simple – because it is modern humans who have mistakenly ‘imagined’ the past through projecting the conditions of the present – back onto it. There is no reason why a space traveller from a distant place and different time, should look like human beings, develop a similar technology to that found on earth, or dress in a familiar manner. When the inverted mind is fully functioning, it has to continuously seek-out and develop ‘connections’ between things without pausing – as this is how such an illogical mind-set must maintain its presence. If it stops ‘converting’ things into other things, then it will collapse into logicality and its previous edifice of religiously inspired interpretation will fall away. Next Post: If the US and China Fight – Which Side Will Chinese Americans Take?